DRoster Premium is FULLY FUNCTIONAL employee scheduling software. Easy to use: Planners for different views, Templates for recurring shifts and special days, Employee info, Calendars,Availability times,Locations. 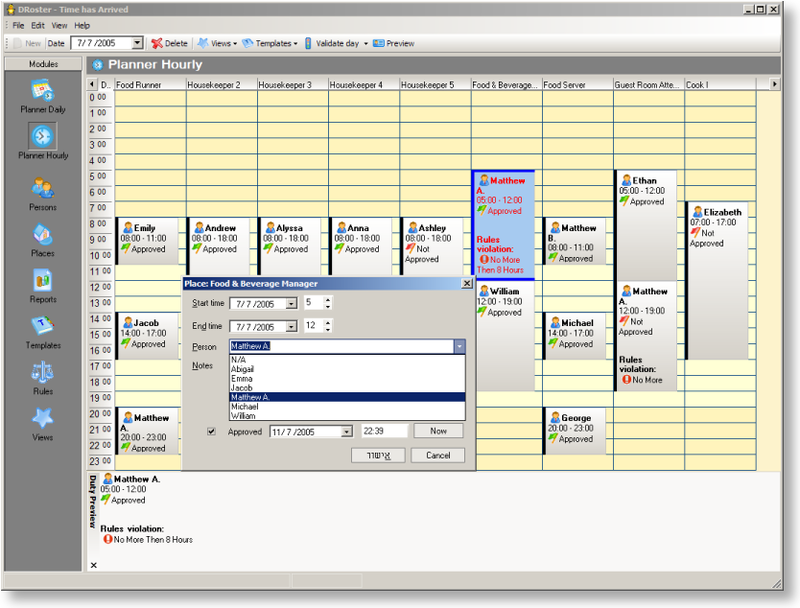 All in neat grid layout make scheduling easy, reliable and you react instantly to changes in scheduling. 100% Customisable shifts. DRoster lets you schedule up to 100 duties, delete old duties to continue scheduling indefinitely. ...... DRoster is highly customisable: change any fields to fit your needs. With DRoster employee scheduling you have complete control of your staff rostering needs regardless of your organization's size. Easy to install and use. To schedule mostly part-time employees and print out weekly schedules. To schedule mostly full-time employees, print out weekly and monthly schedules. Assign Daily tasks to 20 Employees for one year with Excel. Capture the screen of employee's computer real time by matrix screen. Full service EIM utility. Save time and money by installing on only one machine. Mimosa is a timetable software scheduler for schools and universities. Employee Project Clock is a employee time recording system. Tournament, round-robin, official, and practice scheduling for all sports. Know Your Employee's Background! Criminal History! A powerful Time and Attendance solution using fingeprint authentication. versaERS is a flexible and easy to use, but powerful, Employee Rostering System. A LAN monitoring software,An employee computer monitoring software. Qweas is providing links to DRoster - Employee Scheduling Premium 6.6.20 as a courtesy, and makes no representations regarding DRoster - Employee Scheduling or any other applications or any information related thereto. Any questions, complaints or claims regarding this application DRoster - Employee Scheduling Premium 6.6.20 must be directed to the appropriate software vendor. You may click the publisher link of DRoster - Employee Scheduling on the top of this page to get more details about the vendor.